Your squad, on a routine patrol, is ambushed. Your squad has seen combat more than most out in the Krakole Pass. There were the desperate dire wolves last winter and a Hill Giant which was confused and lost but not once have you lost a man, not in the 10 years you all have been stationed together. Today, right now, that changes. PLAYERS BE WARNED Players be warned I, Xalnaga, the DM, am trying to kill. You know those nightmarish games where players complain for years about the DM being unfair, that he/she was on a power trip, that the DM enjoyed killing players. This is going to be one of those games. The good thing is, you know it in advance, you can be prepared… can you beat me? There is a high likelihood that your character will die. In fact I’d almost guarantee that most of the party will not survive the first combat. This is not a game where once you die you can make a new one and join in again. If your character dies you are out. For sure you can hang around in the OOC but once your character is dead your chance in this game is over. If that sounds too callous then this isn’t the game for you. If you like one hell of a challenge, where you will be tested, where you’ll have to scrounge around to regain every hit point you lose, you will not simply be able to take a long rest when you feel like it once you get out of combat. This will be a game where tactics will matter. I’ll house rule things on the fly (Shield Wall gives complete cover to those behind) There will be no random encounters because you will be hunted… that’s if you survive the first combat. 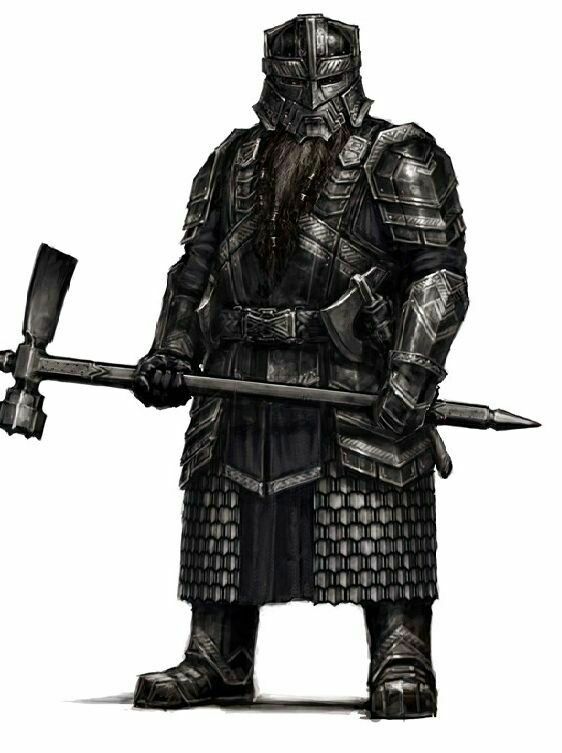 In the Kingdom of Udinthau the Krakole Pass is guarded by 200 Dwarven Soldiers, it’s the only thing connecting the Rasfark Principality with the rest of the kingdom. Now the Pass is not dangerous, the reason You are a Dwarf, can be half dwarf. See below200 dwarves are stationed here is because the Prince Rasfark is the most likely of all the upper echelon in the kingdoms nobility to try and rebel from the crown. The King has 200 reasons on the boarder for the Prince to stay in line. These 200 soldiers are not simple conscripted soldiers, they are professional, hardy, well trained and well equipped. Your home is Fort Helgas is named after the commander who rescued the Halfling kingdom from the Clay Men and bringing the Halfling principality into the creation of the Udinthau kingdom. You’ve lived here for at least ten years now, you know the halls of the fort like it was the nursery you grew up in, Krakole Pass your front yard, Commander Bronzehammer your father and anyone named Sargent your mother. Stone masons took over one hundred years to complete the fort which started out as only a series of caves in the side of the pass and now ensures that all who pass through Krakole now that the Dwarves are strong, powerful and majestic in their ways. As to rolls within this squad I’ll leave that up to you. Anything beyond these four items must be cleared with me first. Anything more than this needs to come with a role played story between yourself and Captain Stonekeg. Captain Stonekeg is always one for a good debate, or a bad debate. You can normally convince him to let you take what you like with a good argument. Captain Stonekeg appreciates the finer points of a conversation which is in stark contrast to Commander Bronzehammer who expects only one thing to be heard out of your lips. “Yes Sir”. Because of the political scope of the kingdom currently I’ll let you choose to be a half-dwarf if you wish. The way this will work is that you gain a +2 to your constitution and on top of that you may choose a +2 from any other race found in the PHB. For example if you chose Dwarf/Elf you may choose either Dex, Int or Wis which are all stats that an elf has racial modifiers for. If you wish Dwarf/Gnome you may choose either Int or Dex as your other racial modifier. You may also choose one racial trait from that race and swap it for a dwarven racial trait. Any questions on this please feel free to ask. Because this is a military styled One-Shot your Lieutenant is in charge. Yes you can choose to disobey an order, to ignore an order but the Lieutenant has command and can issues orders. This will come with other mechanical advantages that I’ll sort out with the Lieutenant. Yes you can apply for any rank. If you think you have what it takes to lead a group of dwarves to safety, to keep them alive… maybe sacrifice one or two so the rest can escape, then apply for the Lieutenant, if you think you are good at following orders then apply for a private. Your squad is heading out to relieve those who are currently at Brown Watch. Your gold and other misc equipment are kept at Fort Helgas and are currently not on you. Between you the squad is carrying, two weeks worth of rations to Brown watch, plus each of you have 5 days of rations and water. The plan is routine, something you do at least twice a year. Head to Brown Watch and watch a few creatures around the mountainside move around and go about their life, maybe spot a Local PegasusGlory once or twice. Go ranging for a day or two just to keep the trails those before you have made still passable, and more than likely you’ll play a lot of cards. Working on a combind back story with another player (whom you've played with before) will also increase your chances. Combined back stories help to bring parties together.Back story: If you want to give me something extra and give your character more depth and increase your chances of getting in then give me a back story. Extra gear: Role play between yourself and Captain Stonekeg for any extra gear. PM me for your actual requests and role play it in your application. Glory is a Pegasi who is often seen soaring above the Krakole pass. The place known as Glory’s Harem is a plateau where he rests at nights. In that same plateau are a handful of hippogriff nests. •	No dwarf has ever manages to ride one of the hippogriffs let alone Glory himself. •	Glory is the nick-name of the Pegasi. Though some dwarves claim to have talked to him, which are often written off as boastful and wishful lying. Count Solarfear is a secret of the kingdom. A Vampire. Known to outsiders as The Never Present Count, for he is not at any formal functions although his name is on the invites. It is through a peace treaty that Count Solarfear holds the legitimate title of Count and has lands which are not invaded. Some of the kingdom’s prisoners which are sentenced to death are shipped to Count Solarfear as payment for his continued seclusion. •	No private has never seen the Count or any of his people. No private has had an officer confirm that the Count is a Vampire. •	The number of Vampires, Vampire spawn or other servants are unknown to any of the Dwarfs. This cave is off limits to all of the soldiers of Udinthau, in fact to any one. Roughly 60 years ago it was discovered, for it is perfectly obscured from below. Four large eggs were found to be in the cave. Kingdom historians and Biologists called them “Dragon Eggs”. When the discovery of dragon eggs was made the Fort Commander of the time said they were to be left alone by everyone. He did not want the mother of the eggs to return to find them hurt, gone or under guard. They’d survived so far without protection so they didn’t need the Kingdoms. •	Once a year a small delegation are sent to see if the eggs are still there. Never are they to be touched. •	There are currently no dragons in the Udinthau Kingdom. Up high on a northern facing plateau is a picturesque garden where bees go from flower to flower year round, where large golden carp live in a crystal spring, where large beautiful trees grow and where small animals find refuge… and where two woodwoads live. •	It is thought that the Woodwoads have been there since before the creation of the Udinthau Kingdom, over 300 years ago. The two gates to the Krakole Pass started out as simply a point on the road, now, two large stone archways stand where taxes in the form of a toll are charged to those heading through it. Where those who go through are registered. •	Two Squads (20 Dwarves) are stationed at West Gate at all times. 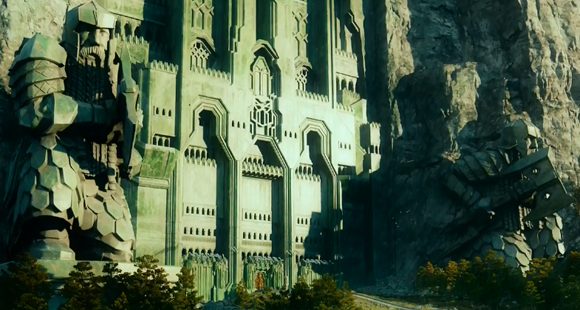 Two towers designed with the thought of giving the dwarves a better vantage point, built high upon cliff faces. Constructed by careful and masterful hands the Green and Brown watch towers stand five stories high have line of sight between each other. •	That squad often sends small ranging parties out for a day or two. Unlike its northern brethren Grey Watch was the first built and has other motives beyond simply giving the dwarves a different base of operations. Built upon the southern face of the mountain range which the Krakole Pass finds its way through, Grey Watch has two purposes. •	Keep watch on Count Solarfear. There is a peace treaty with the Never Present Count but that doesn’t mean that the crown trusts him. The only way to Count Solarfear’s estate is via Grey Watch. •	Keep watch on the lake to the south. In the lake below the Krakole Pass lives a monster of unknown age or origins. No boat survives the waters, no survivor has made it back to shore. This monster forces most trade through the Krakole Pass. Those at the Grey watch are to attempt to map it, and any actions that it takes. •	Two squads (20 soldiers) are stationed at Grey watch at all times. Lewis, Arther’s and Harst Trails are steep and winding but that is the case for anywhere that is not the Krakole Pass. Each day a squad of soldiers (10) leaves Fort Helgas for East Watch and West watch, they stay the night then head back. This means that there is 40 soldiers on the pass during day light hours. At night, none. The journey through the pass can be made in one day if you were to leave Eat watch before first light and made camp at West watch after sun set, most make use of the level ground outside Fort Helgas and make camp there for the night taking two days to get through the Pass. 70 soldiers who are on rest days or performing other duties inside Fort Helgas. Last edited by Xalnaga; 03-10-2019 at 07:54 PM. For applications do you just want character concept/class/background, or finalized character sheets? Last edited by Xalnaga; 01-20-2019 at 09:17 PM. What's your plan for stats? Oh hell yes.. posting interest!! Stats can be either point buy or rolling. No rolling here though as per the site rule for advertising threads. Last edited by Xalnaga; 01-20-2019 at 09:18 PM. Back story: If you want to give me something extra and give your character more depth and increase your chances of getting in then give me a back story. The Ravenshard family has served the King for a long time, even as dwarves reckon such things. Their family crest shows a parchment displaying dwarven runes on the fore of a massive adamantine shield, above which is written: Vara Vapna (which in Dwarven means “Forewarned is forearmed”). As a proud scion of the Ravenshard house, Heili spent much of his youth either in his family’s library learning as much as he could about military history and battle-magic, or on his family’s training grounds practicing with his war pick and shield. He entered into the King’s army as soon as he met the age requirement, but to his family’s surprise, he did not accept a commission to become a lieutenant as his forefathers had. Instead, he enlisted at the rank of corporal. When his father asked why he had done this, Heili replied that in all of his studies of military history, he had never once come across a reliable account of a battle from the perspective of a rank-and-file soldier, and he wanted to create one to further the field of academic research on the subject. As the Company had just lost their official historian to a fit of ague, Heili took up the mantle and began documenting his company’s day-to-day affairs as well as their battles as objectively as he could. 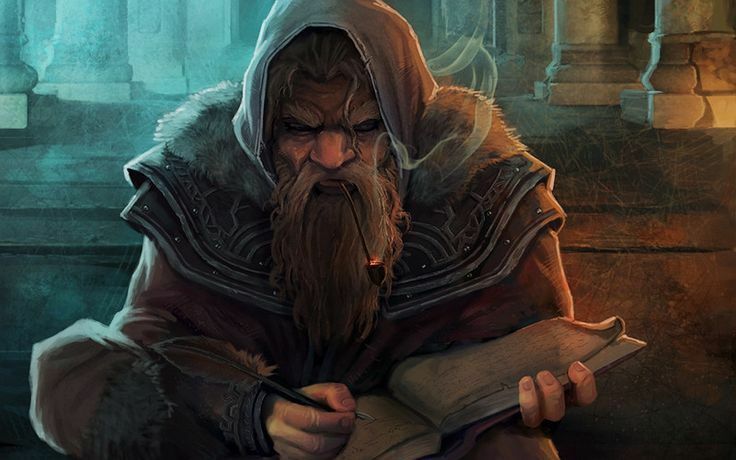 He has performed this task for several years now, and as his fellow soldiers have never known him in another capacity, they have taken to calling him “Quill” for his habit of using his finger to inscribe on his parchments with magic whenever he has a bit of spare time. In garrison and in the field, he trains his soldiers to fight efficiently in a variety of formations and situations, drilling them both physically and mentally to maintain a constant state of readiness for battle. He’d said it under his breath, but was not at all surprised to hear Sgt. Ravenshard’s response. Heili stood at attention in his garrison quarters. He had requested that his family send him some reading materials to help pass the down time on patrol, and knowing his voracious appetite for reading, they had sent him what they thought he could reasonably get through in a 2-3 deployments. The captain happened to see him sign off on the delivery and decided to intervene, and now he had a headache. Heili was a good sergeant, but he was surprisingly impractical about what he packed for patrols. This looks like a lot of fun and a great challange with my favorite race. i'll put something forward when i can. Role: Wound-setter, Company Chaplain, and general worry-wart for his bearded brothers. Backstory: Born to his miner father, Dulgrun Stourstone, and forge-maiden mother, Bransyl Stourstone, Hilgrim grew up in a Dwarven Quarry-Hillock nestled in the distant Tinny Hills a small place in the middle of nowhere where, much to Hilgrim's chagrin, nothing ever happened beyond the day to day monotony. Hilgrim yearned for a life beyond the smoke of the smelters and the sweat of the mines, he wanted something more, to be able to lead a life far more adventurous than one spent with blistered hands and sore muscles at the end of everyday. By the time of his fiftieth birthday Hilgrim had finally had enough, he had spent the last two decades attempting to form something more than a basic militia within his hometown, despite any danger being far removed from them, being in the boonies of the Dwarven lands did not require, it seems, a hardy band of warriors that Hilgrim had always heard tales about. Finally, with a tearful goodbye from his mother and a solemn shoulder-clasp from his father, Hilgrim was off to find adventure in the world, and adventure he did. Hiring out his skills for coin and other treasure Hilgrim bounced from adventuring party to adventuring party, looting ancient ruins and scouring abandoned dungeons for the glimmer of gold. He spent many a year doing this, approximately fifty, with some years being spent spending the coin he had earned or traveling back home for a visit. By the time of his one-hundredth birthday he had tired of being a mere sell-sword, he yearned to be part of something bigger, to form bonds that lasted a lifetime, that is when he saw a recruitment office for Udinthaun Army. He felt fifty years younger when he signed up for service, and even younger when given his uniform and supplies. This giddiness lasted Hilgrim all the way through training and up until his assignment, which was to be at Krakole Pass. Stationed at Fort Helgas Hilgrim spent his time training fresher recruits than he and running errands for the higher-ups. It was during this time that he found his faith in the Father of Battle; Clangeddin Silver beard, and became inducted as an acolyte. 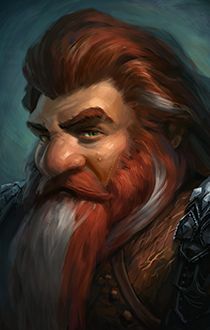 For the next few years Hilgrim slowly but steadily climbed the ranks, proving himself time and time again to be a leader of Dwarves and a beard-brother to the lower ranks. Between errands and time at the chapel devoted to Clangeddin Hilgrim barely ever had time for himself, save for some night walks about the battlements of the Fort, though sometimes he was forced to as apart of the night patrol. Most nights he would hum or whistle and bundle himself in a cloak as he walked about the fine stone fortifications, though one night was different, one night he would treasure for the rest of his career at Fort Helgas. On a particularly cold night, where steam curled from Hilgrim's mouth, and icicles began to form amidst his magnificent beard, Hilgrim saw something truly magical. A winged horse danced about the sky, the stars and Hilgrim the only witnesses to the beautiful dance of Glory, the pegasus who dipped and darted in the cold night sky. It lasted only a few minutes but Hilgrim could swear Glory returned his looks during the barest moments the dance paused, brief moments of what seemed to be kinship as the two's eyes locked. In the days following Hilgrim would swear up and down each night in the canteen about what he saw, only to be dismissed as to have fallen asleep during his night watch. 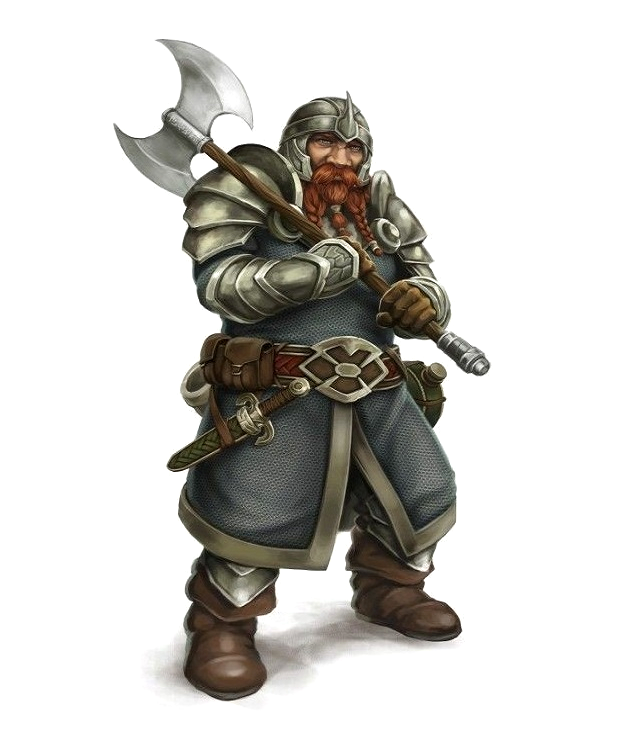 At the age of one-hundred and seventeen Hilgrim was promoted to Lieutenant, and given leadership over a small team of Dwarves, mostly young beards but he was to be given a sergeant so it wasn't all bad. Ten years of camaraderie and brotherhood followed his promotion. His sergeant Thuzmirlun followed orders to a tee, a mindset Hilgrim admired in a soldier. He took special interest in the young-beard Aegir, whom he saw a younger version of himself, the young and headstrong Dwarf he used to be, Hilgrim took special care to make sure Aegir stayed out of trouble and amongst the living. Ten years after his promotion he was given the job to relieve the Dwarves at Brown Watch, an order he gladly took as a means to prove himself capable in his position, and capable enough for a promotion. With a gladsome heart and sure feet he gathered his men and set out for the Watch, naught but bravado and fearlessness in his bosom as he left the protective shadow of Fort Helgas. Last edited by StoneSung; 01-25-2019 at 11:43 PM. Roll: Ranged blaster, backup fighter, backup healer. Back story: Balthazar was the result of an illicit and forbidden love affair between a Tiefling Warlock and Dwarven fighter after a night of wild drinking. The Tiefling father never even knew he had a son. His mom, Georgina couldn’t even remember his name. The clan wanted to terminate the beast immediately, but the mother fought and eventually kept him and raise him. She moved away and came to the Kingdom of Udinthau where they seemed to be more tolerance for differences. Balthazar was never quite like the other dwarves. He was thinner and seem to have a perpetual cloud of darkness over him. He learned his combat skills like all good soldiers and then his warlock skills came on their own. His mother tried to help, getting him all the books and things he needed to learn. There were many who were always suspicious of him and gave him little leeway. They thought he was useless. Just a skinny runt dwarf. Like most dwarves he was conscripted into the military when he came of age. He was stationed at Ft. Helgas in the Karkole Pass. This is where he met Devon Silverspark. A dwarf who also dabbled in the warlock arts even though he followed another patron and god. They were like kin. It was at meal time when he actually felt somewhat free having deep conversations with Devon about the special magic arts of a warlock and the different capabilities they found within each patron. Balthazar was a good soldier. He performed most tasks fairly well. But still the other soldiers doubted his abilities. That was until one day, when his skills shined. His unit was on patrol from the brown watch when they were ambushed by Ogres. The patrol was fighting well, but the odds were not good. Then out of nowhere blasts of power shot across the battlefield drilling one ogre after another. Then arms came out of the ground and grabbed two of the ogres which allowed the other dwarves to cut them down. It turned the tide of the battle. Afterwards, Balthazar was also able to heal some of the wounded. The patrol returned to Ft. Helgas when their rotation was up with the ogre trinkets as trophies and soon word spread of Balthazar’s exploits. From that point on they were still leery of him, but argued over which patrol was going to get him for support. Visit with the Captain: Balthazar had requested the audience with Capt. Stonekeg upon learning they were to head out to the Brown watch once again. He still remembers the event with the ogres. Pvt. Balthazar saluted, did an about face and marched out of the office. ::Well, that went about as expected. He will see the logic of my request when he thinks about it. Time will tell:: Balthazar smiles thinking about the Captains surprise he could be such a proper disciplined soldier when he wanted to be. Last edited by Clawsome; 01-24-2019 at 08:40 PM. Sonetsung, I'm glad someone had the balls to apply for the Lieutenant position. Clawsome, nice to see a half-dwarf in the applications. Rylus, I like to try and make every game fun. Not too heavy. And Yes to answer your question "Would you allow the mystic class? or Artificer?" Last edited by Xalnaga; 01-21-2019 at 06:30 PM. This is sweet! Could be interesting to play in a company of dwarves! Question: Can I get the variant human's feat if I'm half dwarf-half human? In short yes, but notice how many racial traits humans have? Stuff all. If you would like a dwarf with Dwarven traits taken away then yes you can play with the variant feat. I'd honestly have to look and balance it out.